It’s been forever since I’ve had anything to add to the “names and games” file, much less any sort of update to the “It’s a Secret to Everyone” post. But seeing as how that one posts still draws more traffic than anything else on this blog combined, I suppose this is worth posting. Earthbound-ignorant, keep on moving. So beloved childhood game Earthbound boasts all kids of wackiness. It’s just a quirky, offbeat title whose strange asides often go unexplained. However, I found that one brave soul is tackling the game bit-by-bit, looking at how the finalized, English Earthbound developed from the original Japanese version, Mother 2. It’s a pretty massive undertaking, considering the among of text in the game, and I have to hand it to anyone who so loves a video game that they’re willing to examine it in such detail — and in two languages, no less. In particular, translations notes about some of the characters’ names offers a little insight into what was running through the mind of the guy who originally created them. Take Mr. Monotoli, the tycoon ruler of Fourside, the game’s New York City-like area. He’s probably the most famous of the Earthbound bit players, since one of the Earthbound-inspired Smash Bros. stages takes place on to of the Monotoli Buildling, one of the skyscrapers he owns. Given that Mr. Monotoli is an old guy with a lot of cash to spare — and given that the game constantly namechecks American-born pop-culture — I’d always assumed the guy’s name was a play on the word monopoly or maybe Mr. Monopoly himself. Also, the writer of the Earthbound games, Shigesato Itoi, is a weirdly big Monopoly enthusiast as well as president of the Japan Monopoly Association (whose conventions, I’m sure, are nuts). According to the translation tracker, it’s probably just a coincidence. 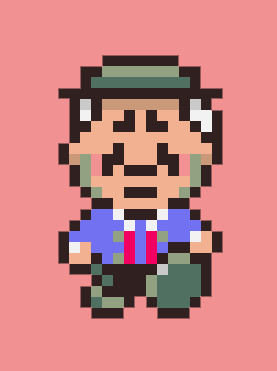 In Japanese, the guy’s name is Monomotchi Monotori, with the first name meaning something like “guy who owns lots of stuff” and the second one meaning “guy who takes stuff.” Basically, a robber baron. The guy doing the translation couldn’t make any more out of the character’s weird first name, Geldegarde, than I could. Then there are the Minches, a family of mostly unpleasant people and the source of the game’s big bad, Porky. 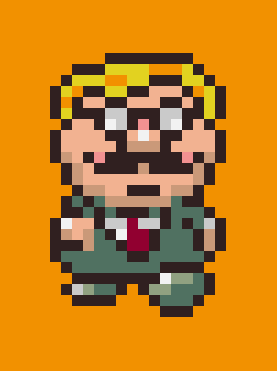 In the Japanese, Porky’s last name is minchi, which means “mincemeat” and even looks like a borrowing of the English “mince,” rendered in Japanese. There’s also a bit more for Aloysius Minch — Porky’s idiot father and a character whose name I guessed was a play on Atticus Finch, literary superdad. In Japanese, his first name is Anburami, which means “greasy” or “oily.” And the wife is Lardna, so there seems like a definite theme for the family’s first names. Only I can’t figure out how Porky’s little brother — Picky, the only skinny Minch — fits in. I will never get tired of digging up old stuff from my childhood and finding out that this or that meant more than I realized at the time. Typo: His first name is MonomOTchi not MonomIchi. If I had to guess, I would say Geldegarde is German-ish for One Who Guards His Guilders. I'm not too sure about Picky. His name is the same (Pikkii) in Japanese, so it was probably just supposed to sound like Porky/Pokey. "The Super Plush Teddy Bear turned into a pile of fluff..."
I've loved Earthbound since someone showed me the wide world of Emulators. And I've played the game at least once a year for about 7 years. It's one of my favorite rpg games. It's fun, bizarre and totally charming. Have you ever played the original Mother, Drew? I started playing recently and it's quite interesting to see the differences and similarities between Mother 1 and 2. Geldegarde seems pretty easy ­— geld = gold or money in Germanic languages, and garde is from guard/gard/ward (to guard, to protect, to watch, a watchman), also Germanic. A very loose (but probably appropriate) translation might be "moneygrubber". Picky is skinny because he's a picky eater.